In many ways, Sunday’s Academy Awards ceremony was so forgettable, it hardly feels worth rehashing Hollywood’s big night. It’s not exactly a shock that ratings for the 87th installment of the show dropped to a six-year low. Can you blame viewers for changing the channel during what was often a dull and disappointing evening? Below, a recap of the low points and highlights of this year’s Oscars. The Host: I’m as big a fan of the ubiquitous Neil Patrick Harris as the next person. The classy, hilarious, self-deprecating former child actor is always a welcome sight, whether in “How I Met Your Mother,” the “Harold and Kumar” movies, “Dr. Horrible’s Sing-Along Blog,” a Broadway musical or one of his countless stints as awards show emcee. So Harris’ almost total failure in his first — and probably last — stint as Oscar host came as a crushing disappointment. It wasn’t really his fault, though. The show was disjointed, badly written, poorly paced and woefully out of touch. For whatever reason, the ceremony’s writers declined to capitalize on Harris’ strengths, resorting to a series of leaden puns and occasionally insensitive ad-libbed banter. Making fun of a winner’s dress after she just mentioned her son’s suicide probably isn’t the best choice, for instance. The night’s longest running gag involved a dramatic magic trick that should have been right up Harris’ alley. But enlisting previous Oscar winner Octavia Harris to keep an eye on a locked box all night verged on insulting and, after a whole lot of build-up, the illusion’s finale was a huge letdown, merely a recap of the evening’s hashtag-worthy events. Yes, there were occasionally funny bits. I liked the part where Harris walked through the audience in nothing but tighty whities, a la Michael Keaton’s “Birdman” character, encountering a drumming Miles Teller along the way, but I’m guessing a large portion of viewers didn’t get the joke since they hadn’t seen the films. Overall, the evening felt strained and “uptight,” as several guests at an Oscar party I attended remarked. The Academy still has a long way to go to make Hollywood’s most celebrated awards show more relevant and entertaining to its biggest audience — everyone who doesn’t happen to be an industry insider. John Travolta and Other Awkward/Insensitive Moments: I already mentioned Harris’ callous mockery of the dress worn by a producer of a documentary about crisis hotlines, who also happened to be a bereaved mother. Sadly, Sunday’s Oscars were full of other painfully awkward and insensitive gaffs. There was Sean Penn’s joke about green cards before presenting one of the night’s biggest awards to “Birdman” director Gabriel Gonzalez Inarritu. There was Terrence Howard’s strange and overly emotional introduction of “The Imitation Game.” There was Harris’ mispronunciation of “12 Years a Slave” star Chiwetel Ejiofor’s name. However, the most jaw-dropping embarrassment occurred in the ill-advised union of “Frozen” star Idina Menzel and John Travolta, who shared the stage to present the award for best original song. As you may recall, Travolta became a Twitter legend after bungling Menzel’s name at last year’s Oscar ceremony, spawning legions of “Adele Dazeem” jokes. The show’s producers no doubt thought it would be touching, or perhaps funny, to give Travolta the opportunity to extend an olive branch to Menzel, but their meeting quickly devolved into ickiness as Travolta grabbed his co-presenter’s chin in his hand while she vainly struggled to be free of his grasp. That’s the stuff of ratings and social media fame, but it also left a yucky taste in our mouths. The Music: The ceremony opened with a lively, old-fashioned, Sondheim-esque musical number by seasoned showman Harris, the talented Anna Kendrick — dressed as Cinderella, a la “Into the Woods,” and an impish Jack Black. Penned by “Frozen” songwriters Robert Lopez and Kristin Anderson-Lopez, the piece celebrated the magic of “moving pictures,” poking fun at the Academy Awards and paying homage to classic and popular films. The lyrics were playful and clever — “I love happy endings. Except for in ‘Gone Girl’ when that lady slit your throat,” Kendrick crooned to Harris — and even got a little edgy when Black crashed the party with a roll call of the industry’s flaws and a jab at modern moviegoers’ obsession with “screens in our jeans.” It was a nice twist on the traditional song-and-dance prologue we’ve come to expect from the show. Building on that momentum, Tegan and Sara and comedy trio The Lonely Island hit the stage to perform best song nominee “Everything is Awesome” in a performance so surreal and fun, it immediately provided the event a much needed jolt of energy. 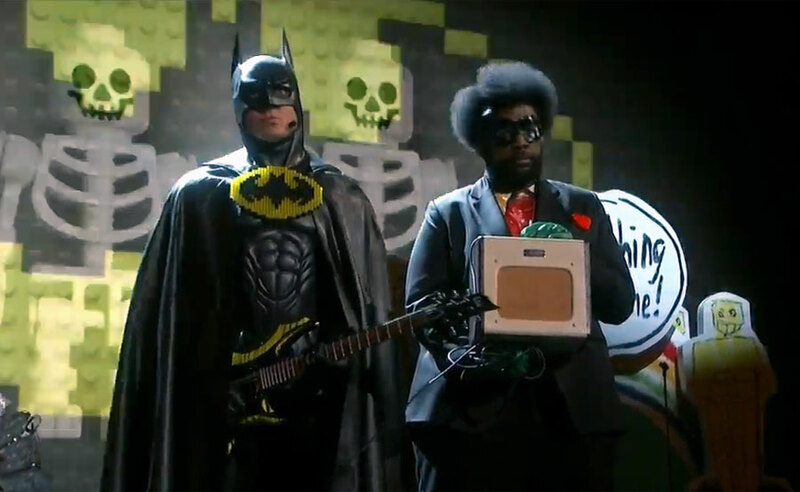 “The Lego Movie” may have been snubbed in the best animated feature film category, but it stole the night with a Lego choir, Lego Oscar statuettes, an assortment of costumed dancers, a cape-wearing Andy Samberg, Will Arnett as Batman and cameos by Questlove and Devo’s Mark Mothersbaugh. Unfortunately, the moment didn’t last. The rest of the night’s musical performances were a snooze with the exception of John Legend and Common’s rousing rendition of “Glory,” from the movie “Selma.” The winning song brought the Dolby Theatre to its feet and tears to the eyes of many, including Chris Pine, whose effusive reaction became Twitter fodder. As for Lady Gaga’s impressive but random tribute to “The Sound of Music,” it was just another head-scratching moment in a ceremony that too often felt confused and cobbled together. Better to have used the time to give host Harris a chance to show his stuff. The Speeches: In a telecast that lacked humor and energy, with predictable results in all but the minor categories, the winners’ speeches provided brief glimmers of passion, inspiration and controversy. Accepting the best supporting actor award for “Whiplash,” J.K. Simmons sweetly commanded the viewing audience to call their parents. Best actress and actor winners Julianne Moore and Eddie Redmayne dedicated their statuettes to sufferers of Alzheimer’s and ALS, respectively. Best song winners Common and John Legend showed us how acceptance speeches should be done with a pair of graceful statements about civil rights. “The spirit of this bridge transcends race, gender, religion, sexual orientation, and social status,” Common said, referring to Alabama’s Edmund Pettus Bridge, immortalized by Martin Luther King Jr.
“Selma is now because the struggle for justice is right now,” Legend added. One of the night’s most talked-about speeches came courtesy of best supporting actress Patricia Arquette, who honored her “Boyhood” character, a struggling single mom, with a demand for equal pay for women. Her statement was met with both enthusiasm — Meryl Streep leaped to her feet to show her approval — and outrage. Whether you agreed with Streep or not, you had to admit it was one of the night’s most memorable occasions. This entry was posted in Uncategorized and tagged Academy Awards, Common, Everything is Awesome, Gabriel Gonzalez Inarritu, Idina Menzel, JK Simmons, John Legend, John Travolta, Lady Gaga, Neil Patrick Harris, Octavia Spencer, Oscars, Patricia Arquette, Sean Penn, The Lego Movie, The Sound of Music on February 24, 2015 by Lavender Vroman.